About the Breeders About the Breed About the Breeding Stock New Litter is HERE! When my husband and I decided it was time to add a new four-legged family member to our family, the nurse in me immediately kicked in. I immediately began my search to find the perfect breed to adopt and easily settled on the Multigenerational Australian Miniature Labradoodle. I then turned my attention to where we would adopt our beloved four-legged family member. I contacted countless breeders, but I just wasn't satisfied with what I was hearing, nor was I connecting with them as people. It was out of my frustration that I contacted the Australian Labradoodle club. It was the Australian Labradoodle club that gave me the name of Jenny Blume with Swinging Gate Labradoodle. I contacted Jenny Blume and immediately realized I had been directed to the right place. Jenny is wonderful, sincerely loves her labradoodles, and also loves placing them in good homes. Jenny was patient to answer all of my questions and has answered every call and question since. It was at Swinging Gate Labradoodles where we adopted our beloved Eliott. Eliott is the sweetest, smartest labradoodle you will ever meet. Not to mention, he can be quite funny. We fell in love with his size – not too small ( for a 6 feet 2 inch male) and not too big (for a 4 foot 11 inch woman). He is gentle with children and, oh, is he beautiful. He has a beautiful black coat that shines like mink. We cannot take him out without some stranger commenting on his beauty. We also love that he is a non-shedder. I, Carolyn, am a nurse practitioner who has been practicing as a nurse and nurse practitioner for a combined 26 years. I have worked in many areas of medicine. I love anything nursing-related. My husband, Darrell, is a retired law enforcement officer with twenty-three years of service. Our children are all grown and living on there own. As I stated earlier, I have maintained contact with Jenny Blume, whom I now consider my friend, since we received Eliott. I call Jenny for everything Eliott-related as well as how to get more "Eliotts" in our home. It was soon suggested to us that we become breeders, a prospect which excited us and to which we readily agreed. Thus, Gate City Labradoodles was born with Jenny Blume mentoring us all the way. The first labradoodle was bred by Wally Conrad who was the manager of a puppy program for the blind. He received a letter from a woman who was blind and in need of a dog, but her husband had many allergies including dogs. In her letter, the woman stated she was also interested in a dog that did not shed. Mr. Wally Conrad bred a labrador and a poodle calling it a labradoodle. The Gate City Labradoodles are from Swinging Gate Labradoodles. The Swinging Gate Labradoodles are from the blood line perfected by the owners of Tegan Park and Rutland Manor based in Australia. The temperament of the Gate City Labradoodle parents is social and affectionate. We love having them among us. They are very easy to train. They have adapted to our schedule very easily. They are very gentle with children and older adults. We do recommend training if you have small children, special needs children, or older adults. They are funny, clever, and at times very precocious. I believe they understand much more then we realize. The size of our Gate City Labradoodles ranges from 13 to 17 inches in height and between 15 to 38 lbs. in weight. Their coat colors may be black, white, cream, chocolate, apricot, or red. They may also have any variation of the above colors which, we call parti or parti factor. Their coat textures can be wool which is thick, coarse, but soft; fleece, which is soft but silkier; or straight which may be coarser in texture. The coats can be curly, wavy, straight, or any combination thereof. 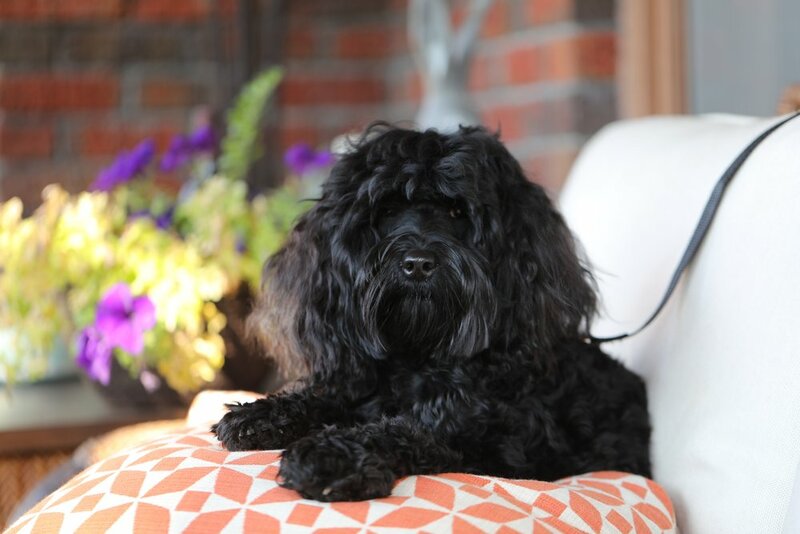 Click here to meet the new addition to the Gate City Labradoodle family! Ms. Maple came to Gate City Labradoodles from Swinging Gate Labradoodles. She is maintained in our home as a member of the family. She has a beautiful apricot wavy fleece. As you can see from her picture, she is a cutie pie. She has a wonderfully sweet personality. We are hoping for a litter sometime next year. Click here for Maple's ALCA Registration and Pedigree. Ms. Razen comes to Gate City Labradoodles from Swinging Gate Labradoodles. She has a beautiful black, silky, wavy fleece. She is a loving, sweet girl that we are happy to have as a part of our family. We are hoping for a Razen litter in 2018. Click here for Razen's ALCA Registration and Pedigree. Tucker comes to Gate City Labradoodles from Swing Gate Labradoodles. He is quite the character. His wavy fleece coat is white anc chocolate. Tucker is available for stud service. Click here for Tucker’s ALCA Registration and Pedigree. Once you have submitted your Gate City Adoption Application and deposit of $500.00 your name will be placed on a waiting list. You will remain on the adoption list until you have chosen a puppy to adopt. You may chose to defer to later liters, in which case your name will move to the top of the list. Each puppy is $3,000.00. If your puppy will need to be shipped to you, we require $500.00 shipping fee that covers both shipping crate, health certificate (required by the airline), airfare to any major US airport. A$500.00 deposit is required to hold a particular puppy, with the balance due by the time the puppy reaches seven weeks of age. When would you ideally like to receive your Gate City Australian Labradoodle? If "Yes," will your puppy be trained for service? Are there any additional details you would like to share with Gate City Labradoodles as we consider your application? By typing your full name in this box, you confirm that you have answered these questions truthfully and to the best of your ability. Furthermore, you confirm your understanding that your application will not be considered until a deposit of $500 has been received by Gate City Labradoodles. 5. Basic commands, including name recognition. Our 4-week Starting Gate Training Program includes continued labradoodle training as well as a health maintenance package. With the health maintenance package, we will also take your new labradoddle to the vet for puppy shots and possible deworming. Space in the 2 and/or 4-week Starting Gate Training Program is limited. Payment for the Starting Gate program is due when enrolled and is non-refundable. Our guardianship program allows you to have a Gate City Labradoodle as a part of your family for a non-refundable $500.00. Gate City Labradoodles simply retains sole breeding rights. The guardian simply makes the Gate City labradoodle available for breeding. We cover all health testing and breeding-related expenses. The guardian is expected to pay for normal expenses related to the heath and wellness of the labradoodle. The guardian is expected to maintain the labradoodle as a part of the family for socialization and provide regular exercise. The Gate City labradoodle will have regular vet visits. They are to be kept up-to-date on all their vaccinations. The labradoodle is to be maintained on a high-quality dog food, preferably Royal Canin age-appropriate. The labradoodle will receive monthly heart worm, flea, and tick prevention. This is a great opportunity for a great Gate City labradoodle to be placed in a great home. 1. You must live within one and a half hours of the Greensboro area. 2. You must have a fenced yard and be home most days. 4. You must be willing to train a puppy (including potty training). No one wants a badly behaved dog. A well-trained puppy earns greater freedom and is a joy to live with and take out and about. 5. You must keep dog/ puppy as an inside dog and must not leave your dog/ puppy alone for extended periods of time. These are not kennel dogs although they can be and should be properly crate trained. 6. The Gate City breeding dog must come to us at various times during the year. Our guardian family must be able to make the dog available to us upon request and with sufficient notice, for various types of testing, breeding and whelping, etc. 7. Reliable transportation is necessary. 8. To become a guardian you sign a Gate City Guardian contract along with a $500.00 non-refundable deposit which is required. The contract is complete when the breeder no longer needs the Labradoodle for breeding purposes. The breeder reserves the right to select an appropriate guardian home (which may include a home visit) to maintain a Gate City Labradoodle. Q. How can I adopt a Labradoodle? A. The cost of the Labradoodle is $3000.00. There is a $500.00 non refundable reserve fee. You fill out the application to be placed on the list. Q. Are Gate City Labradoodles kept in the home? Q. If I purchase a Gate City Labradoodle will I have to have it spayed or neutered? A. Yes, you are agreeing to have your Gate City Labradoodle spayed or neutered. Q. Will my Gate City Labradoodle be vaccinated before I take it home? A. Your Labradoodle will have had its first shots, been dewormed and microchipped. Q. What if my desired puppy is not available in the litter? A. We will keep you on the list until your desired puppy becomes available. Q. How old will our puppy be in order for us to bring it home? A. Puppies will be ready to go to their new home at approximately 8 weeks. Q. Do I have to pick my puppy up or can it be shipped to me? A. Your puppy can be shipped to you for $500.00. Q. Can I request that my puppy be trained? Q. Can a Labradoodle be kept outside? A. No, this is a dog to be kept in the home and is a part of the family. Gate City Labradoodles proudly accepts payment through Square, Inc.